624 pages | 23 B/W Illus. A thorough introduction to the politics of the four regions of Asia from the perspectives of democratization, foreign policy, political economy, and political culture. An examination of the "Big Three" of Asia – China, India, and Japan – focusing on issues including post-Mao reform, China’s new world outlook, Indian democracy, and Japanese foreign policy. A discussion of important contemporary issues, such as human rights, the politics of the internet, security, nationalism, and geopolitics. An analysis of the relationship between politics and certain theoretical ideas, such as Confucianism, Hinduism, socialist constitutionalism, and gender norms. As an invaluable and all-inclusive resource, this handbook will be useful for students, scholars, researchers, and practitioners of Asian politics and comparative politics. Professor Shiping Hua has done a superb job in editing this major reference volume. 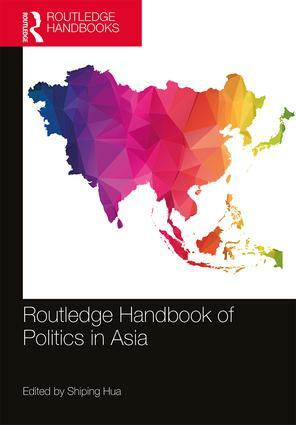 The Handbook of Politics in Asia is encyclopedic in coverage. It offers in-depth discussions of a broad range of topics and themes for major countries and sub-regions of Asia. This is a must-have volume for every research library. The chapters of this handbook are brilliantly organized. They first provide full and systematic coverage, in East, Southeast, South, and Central Asia, of all regime types, foreign policies, development plans, and political cultures. Then they shift to interpretations of nationalism, regionalism, reforms, and diplomacy in three large states: China, India, and Japan. Pre-modern cultures are shown to have current effects. Anyone interested in Asia absolutely needs this book. This handbook, capably edited by Professor Shiping Hua, makes a major contribution to filling the gap in the general education curriculum. With informative chapters on everything from multilateral trade agreements to gender politics or internet management, all supplemented by rich graphic data, this book is ideal for courses in comparative politics or international relations or indeed for all interested readers. Part 4: Explaining Asia: Theories. Shiping Hua is the Calvin and Helen Lang Distinguished Chair in Asian Studies, Professor of Political Science, and Director of Asian Studies Program at the University of Louisville, USA.